You are a lowly minion among the hordes that infest a dungeon. Tired of being so low on the totem pole you and your friend decide to make a move when your dungeon is attacked by heroes and everyone else is distracted. 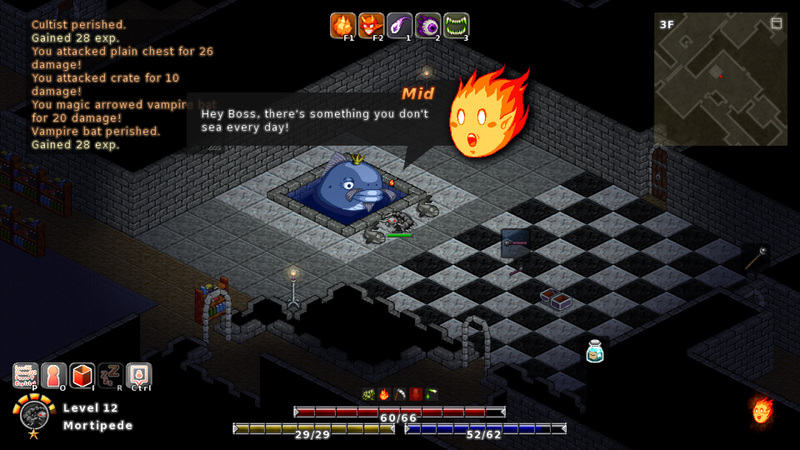 At least that is what you do in the game Midboss by Kitsune games. You play as an imp with the ability to possess other monsters that is referred to by his little fireball friend as Boss. The fireball himself is called Mid (Mid and Boss, get it?) and he does all the talking for the pair. He also provides the tutorial and some hints throughout the game. He reminds me a little of Clippy, the paper clip that use to haunt Microsoft Word, only far less annoying. He can be a bit repetitive, every time you level up he lets you know you should spend your points and things like that, but if that bothers you he is easy to ignore. 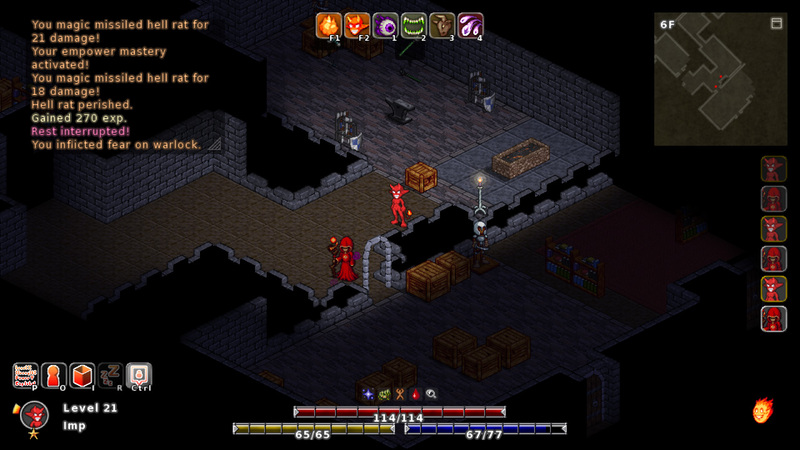 The ability to possess other monsters in the dungeon is the primary mechanic to the game. You have an ability that you cast on an enemy and when they die you take over their body. It took me a few runs to realize just how important it is to change and change frequently. It lets you adapt, change your skills and most importantly, its the easiest way to heal yourself. You can level up each form to learn skills and to eventually master it. Mastering a form gives you better stat multipliers when you equip it as a backup soul as well as all the abilities for that form. You can run around as the imp as well, and he can equip three different backup forms, his stats are based off of the best multiplier between them and access to all their abilities. You’re stronger as the imp in general but when he dies its game over. You progress through the game floor by floor with each one getting more difficult as you go. At times if felt like the difficulty spiked a lot going from one floor to the next. You could be wiping the floor with enemies on one floor and then go down to the next and just get destroyed by the first monster you came across. There is a merchant who shows up on every other floor who allows you to sell off your old goods and maybe pick up something new. He has a nice range of gear too, there is always some nice rare stuff that can help you out a lot if you have enough to saved up to buy them. He is a talking cat and I like that the currency for the game is balls of yarn as the cat tells you he has no need for money. When you level up you get to put points into four categories; violence, cruelty, adamancy and relentlessness. Each of them effect a number of other stats, violence increases your strength and power (physical and magic attacks respectively) and cruelty will effect your criticals. It was a little confusing at first, but taking some time to mouse over everything and read helped a lot. Though I occasionally still had to take some time to double check when I get new gear to figure out which stats I want to use (what was the difference between force and focus again?). When you inevitably meet your end you will get a ‘Death Card’ which has a brief recap of of your play through. It lets you know things like what form you used the most, how you died and how many turns you survived. I always enjoy reading over them when I die and if you are so inclined the game has built in methods to share them on social media. 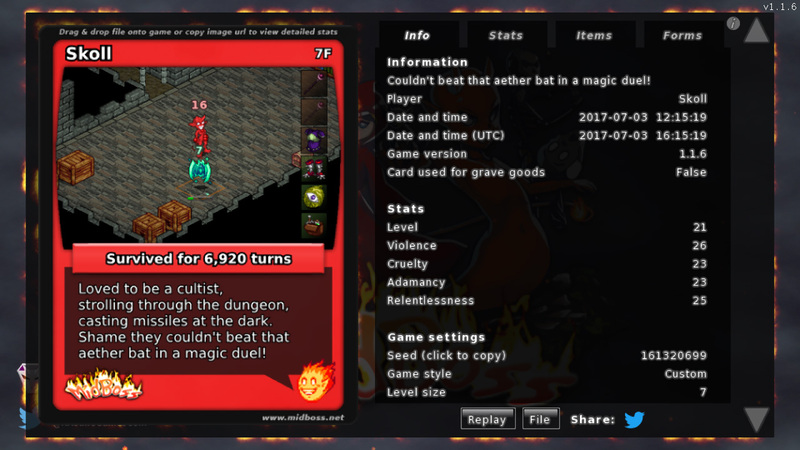 The Death Cards also help you with progression. When starting a new game you can use a card to carry over a single piece of equipment from that play through. You can only use each death card once though so choose wisely. You can make custom games, where you adjust things like experience gain, rare find and floor size. At first I thought this would break the game, if I gain lots of levels and got all the rare loot surely I would be able to crush the game. That wasn’t actually the case. It helped, the first little bit was a breeze, but the later part still required thinking about how to tackle certain situations or enemies. There is nothing overly exciting about the graphics but I liked them all the same. It is pixelated but they managed to put in a good amount of detail in some of the sprites. Levels can be big and some rooms really open with not a lot of variety between them. There are some items you can find that unlock different filters for the game based off retro gaming systems (Gameboy and Commodore 64 to name of few and I am a bit fan of the pen and paper one). Music fits the game nicely and changes up when you are in combat and just exploring so it doesn’t get too repetitive. My main problem with the game is unfortunately also the first thing you really have to deal with and that would be the controls. You can use either the keyboard or mouse to move Boss around the dungeon. The keyboard uses WASD for the most part as well as QEZC to move in every direction. The problem is the map is kind of at an angle and up, well it isn’t straight up. No matter how I changed the controls I could never really get the keyboard input to feel comfortable. This isn’t insurmountable though, I started to use mouse and while it was still a little clunky I got through it and could enjoy the game. 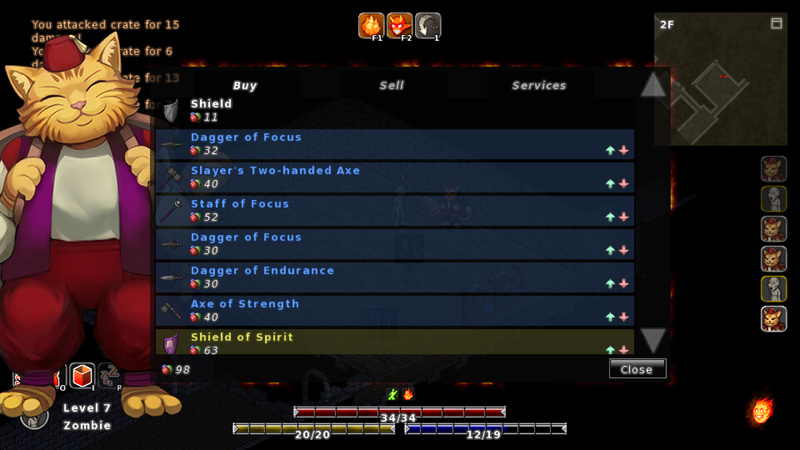 Overall I enjoyed my time with Midboss quite a lot. I got really excited when I figured out new ways to tackle enemies and when I found new gear. I’m amassing a collection of death cards so that I can carry over an awesome full set of armor. Sure the controls gave me a hell of a time to start, but now that this review is done I am going to continue playing it for some time. It was challenging but that is what Roguelikes are supposed to be and it was always more fun than frustrating.